The arbitral tribunal rules that significant environmental damage has been done — and China is to blame. On July 12, an arbitral tribunal issued its ruling in Philippines vs. China, the case brought by Manila challenging China’s claims and actions in the South China Sea. While much of the case dealt with the nitty-gritty details of the status of certain features under the UN Convention on the Law of the Sea (UNCLOS) or on the legal legitimacy of “historic rights,” one section veered away from the legal and into the scientific. 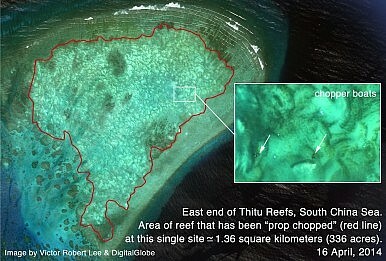 In addition to evaluating China’s claims, the tribunal has been asked to look at how Chinese activities had impacted the marine environment of the South China Sea. Fidel Ramos will steer clear of the controversial South China Sea case in his discussions with "old friends."